Nylon sling bench, 15.5" x 6.25". AllegroMedical.com presents The Drive Folding Lightweight Cane with Sling Style Seat. 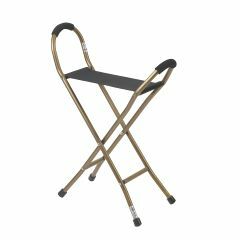 The Drive Cane Sling/Seat is a versatile and convenient seating device, when open and a strong quad cane, when closed. This device is intended for individuals who need to rest when walking a long distance. The four legs with vinyl tips serves as a better walking aid than most 3-legged canes. It is equipped with a durable nylon sling seat that wraps around and secures with a hook and loop closure when the seat is not in use. Individuals can comfortably hold onto this device on the padded foam grip handles. I have owned mine over 5yrs. It is sturdy, strong and durable. I am 240lbs and it hold me just fine. Suggestion for inexpensive way to replace tips: You can take your cane to Ace Hardware or any hardware that sells rubber tips for furniture like chairs. They are not a perfect fit but will do as an alternative to going to a medical supply company that charges a whole lot more. You can take your cane to Ace Hardware or any hardware that sells rubber tips for furniture like chairs. They are not a perfect fit but will do as an alternative to going to a medical supply company that charges a whole lot more.